I have very vivid childhood memories of my mom, my two younger sisters, and myself sitting around in our pajamas watching the Miss America Pageant year after year. We watched that Pageant religiously throughout the ’80s and ’90s, even holding our own pageants complete with makeshift tiaras and sashes in the basement of our Bel-Ridge house. We coveted that crown and thought, perhaps, one day it would be us on that stage, crying and waving as we walked down the runway to the famous song: “There she is… Miss America…” Alas, my dream of becoming Miss America was not meant to be but that doesn’t mean I don’t appreciate the positive influence it has on helping young girls realize their own dreams. The Miss America pageant began in 1921, just a couple of years after Congress passed the 19th Amendment, giving women the right to vote. Since then, Miss America has been a symbol of beauty, grace, and oftentimes politics–a symbol of the times, really. Our new Miss America, like our re-elected President, is a reflection of an America longing for role models who look different than our Founding Fathers. The Miss America Pageant and its public have openly accepted many types of diversity over the years, albeit not enough by any standard. For example, Alexis Wineman, Miss Montana 2012, competed in the 92nd annual Miss America Pageant. She was the first contestant diagnosed with Autism. During the latest Miss America Pageant, Miss Iowa, a 23-year-old vocalist born without her left forearm, competed for the crown as well. In 1995, Heather Whitestone, became the First Deaf Miss America. So I find it surprising that there are a group of outspoken Americans who are angry about the crowning of the new Miss America. Their vitriolic comments lead me to believe that it’s not a concern over accepting diversity but a concern over accepting racial diversity. That’s a sad realization in the year 2013 but a realization nonetheless–one that we should be aware of, acknowledge, but not accept as a guide for our moral compass. What they fail to understand, however, is that by discrediting the new Miss America they are directly contributing to our children’s lack of self-esteem and identity, especially that of young girls. It’s no secret that our society still struggles with race, culture, and what it means to be diverse. Much of that burden falls on the shoulders of mothers, teaching and encouraging their children to reach for the stars in true American spirit but with gentle caution about the reality of how race effects the reality of their dream. I imagine that mothers to young girls take extra care to ensure their daughters don’t fall victim to self-esteem and identity issues, especially when it comes to race. So when girls are able to see an older, successful version of themselves it makes their dreams feel that much closer and the color of their skin becomes secondary. As such, when the new Miss America, an Indian-American, was crowned a winner I bet there were suddenly a whole lot more little girls who realized that their dreams of becoming a scientist, doctor, or even Miss America were not so far-fetched after all. Thank you Miss America for helping the next generation of young women rise above the naysayers to realize their own dreams, just like you did. It doesn’t matter how smart you are—test anxiety can get the best of anyone. However, you can outsmart test anxiety with a simple plan of attack: Confidence! I know it sounds trite but confidence is the key to overcoming so many different kinds of obstacles, including scary test anxiety. This fact was never more evident than when I recently proctored an exam for a few students: some were visibly stressed out, second-guessing their answers, and physically exhausted while others took the test willingly and were even excited to show the graders what they knew. A common misconception about test anxiety is that the student is anxious because they don’t know the information presented. Although there may be some questions the student won’t know, the underpinnings of test anxiety mostly come from the fact that the student is extremely intuitive and understands the pressure riding on the exam. Test anxiety is less about concerns over content mastery and more about the underlying pressure to be perfect. In general, I’ve found that students who remain calm, clear, and understand the fact that nothing in life is perfect, including a test, do better overall on an exam. Why? Well, they simply don’t psych themselves out. On the other hand, students who realize the repercussions, no matter how big or small, of failing an exam (or simply just not doing as well as they want) are less likely to do the best because their emotional response to the unknown clouds their ability to focus and power-through. When I saw some of these students excited, almost chomping at the bit, to the take the exam, I watched as their ability to use logic, deductive reasoning, and comprehend what skill the question was attempting to test helped them keep their rationale and their cool. I took a mental note for myself. At some point in my own academic career, I realized that each test would affect my grade and that my grades would, in turn, affect my ability to go to the next level of education. When I got to college and then law school, it was not only my GPA that was of concern but now my promissory notes. Subsequently, more pressure ensued and more anxiety reared its ugly head. So as I sat next to these students who flew through a difficult exam with ease, I had an ‘ah ha’ moment myself: I realized I needed to find my confidence once again. It was a little reminder of a bigger lesson: learning is a two-way street–students learn from their teachers and teachers can always learn from their students. My Mom is always doing a million things and never quite finishes her thoughts, planning her next day out loud as she walks around the house putting things here and there. In fact, when my brother-in-law first met my Mom she asked him a string of questions and before he could answer she proceeded to trail off on another topic as she left the room to put away something. He turned to my sister and asked, “Should we answer her?” My sister replied, “Nah, she’s just talking to her herself”. Albeit hard to have a direct conversation with my Mom she continues to put her stamp on this world, maintaining her quirky, expressive nature as a fun-loving drama coach, former hippie, and newfound potter. 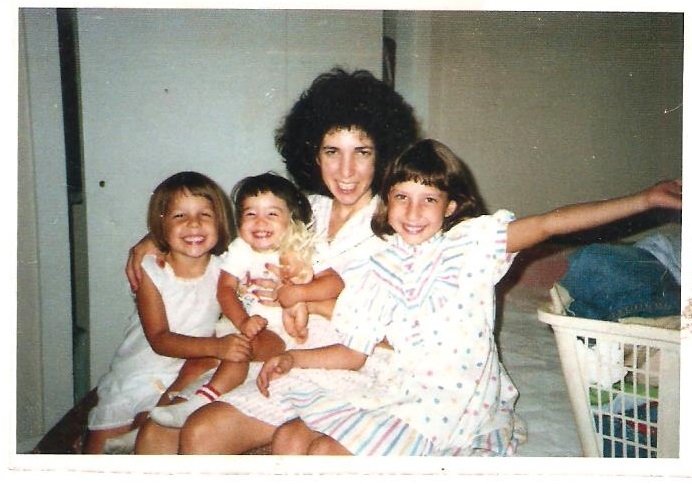 The picture above is one of my Mom, my two sisters and myself in 1987. By the way, I’m the one presenting the laundry like Vanna White. Not sure why? Perhaps, I just like to present things. Ladies and Gentlemen, I present to you my Mom. Me: Mom, in honor of Mother’s Day this year can I ask you a smattering of mom related questions for my Mother’s Day blog post? Question 1: Why did you decide to become a mom? Mom: No one decides to become a mom. [She laughs] In your generation they plan it and in my generation they didn’t. Mom: Definitely 16. You guys scared the crap out of us [parents]. It was a very stressful time thinking about you girls growing up and having a lot of independence but still not adults yet. We had to think about insurance, the end of high school, how much money it will all cost for college. You girls were hanging out with friends we don’t like, lying to your parents…. Me: Wait, wait a minute here. I know you’re not talking about me, right? Mom: No, no you were a good kid. Me: You’re talking about Sister Number 2 right? Mom: Um…yes. Of course, honey. Question 3: What were your discipline techniques? Mom: [she laughs] Next question. No, we didn’t really have any conscious discipline techniques, did I honey? [She turns to my Dad to confirm and I hear him in the background give an affirmative “No”] Oh, I was just an improver. (says my Mom the drama teacher) You were all basically good kids. I made life happy. Question 4: How much do you think I cost you? Mom: Oh you were cheap. Cheapest kid. Question 5: Who was the most expensive kid? Mom: Ah well, do we even have to ask. Me: She’s living back at home, isn’t she? Question 6: What is one of your fondest memories from when we were kids? Mom: I have such good memories of you girls. I dressed you up for Halloween and we all went trick-or-treating and gave Dad all the candy to sort and eat. When I had that little preschool at the house and you had your little friends there. You were so adorable. You loved Strawberry Shortcake and Hello Kitty. So cute. We always had Shoney Birthday Coupons for a free meal so once a year we made sure that we took advantage of that one. We did a lot of free things: free VBS and all the free birthday restaurant sign- ups. I will never forget when we were all dressed up coming back from Pasadena Players (our local melodrama play production) and I was a new driver. I saw the light flashing red. So I turned around to my 9 year old daughter (me) and asked, “Should I go or do I stay?” You said, “Go Mom!” And of course I went and got pulled over. A $75 ticket! I had to sell my sewing machine to a friend to pay for it. My brand new sewing machine. Me: [I guess I know what I’ll be getting her for Mother’s Day, right] Mom, why did you wait so long to learn how to drive? Mom: Well, in high school they said I had poor depth perception and I ran over the cones but I did well on the written test. My Dad had a Cadillac at the time and my Mom had a VW Bug and I took driving lessons at Santa Monica College. Afterwards, we’d go out to this cute little French creperie [trailed off topic to to tell me what my dad was watching on T.V. at the moment]. The course ended before I really learned. Also, people don’t like to loan out their cars especially to those who are learning how to drive. So I ended up getting my license when I was 36 years old. I’m what you call a “late bloomer”. Me: Wait a minute. So you started learning how to drive when you were 16 and 20 years later got your license? Mom: I’m just one of these people that adapt and adjust. I finally had three kids and got tired of shelping you girls on the bus. Question 7: What do you think parents today face that’s different from what you faced raising kids in the 80’s and 90’s? Mom: Well, I think one thing is the technology that kids are so addicted to these days. You gotta set limits but it’s very hard because it’s so addicting and kids are very demanding. Me: I’m sure we were demanding as kids too. How did you quell that for us girls? Mom: Well, we couldn’t afford it so we had to set boundaries. Each of you got one wish-list-type toy for the holidays and birthdays but we also got you little stuff. People didn’t have a lot in our neighborhood so we were all used to stretching that dollar very far. Question 8: What do you wish you could have done differently as a parent when we were all young? Mom: It would have been nice to have some friends for Dad and myself who also had small kids. And I would have liked to learn how to drive sooner. Question 9: What was it like raising your kids with mixed religions? Did your Jewish family understand your Catholic husband? Mom: Well, everybody kind of accepted it. I kind of did my own thing. My relatives were very accepting even if they didn’t always understand it. My Grandpa was very tolerant. I grew up having Christmas Trees in my family’s bridal retail stores so my we all kind of followed the Americana Calendar of Life. We sold a lot of merchandise during the Easter season too so we embraced it really. I did date a couple of Jewish guys but I also dated some Catholic guys and ended up with your father. It’s 35 years later and I still like him so I guess that says something. Question 10: What are you working on now in pottery class? Mom: I made a donut stand. Mom: Well, I was supposed to be a pot but it fell. So now it’s a donut stand. By the way, honey, I don’t want my real name out in the cyber space. So don’t use my real name. Me: Okay, Mom. But I think people are going to find out one way or another. Ya know almost everything about a person’s identity is on the internet now and I’m including a picture of you. Mom: I know, I know. But keep my name out of the cyber space. Me: Okay, Mom. Love you. Mom: I love you, honey. My mom, who shall remain nameless, is an English, Speech, and Drama teacher by trade and runs her own community theater groups for young and old alike. She is the proud mom of three young women, all of whom are college-educated and productive members of society.